Honey is a great ingredients for drinks now. 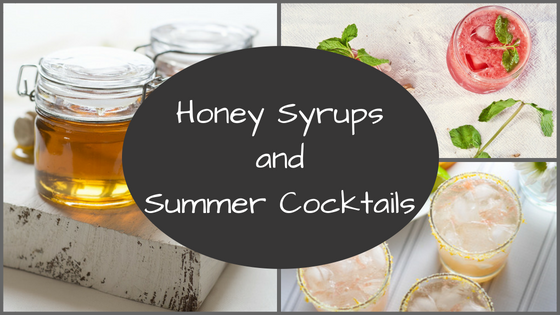 It's a great way to, not only increase the flavor, but also bring some local ingredients to your summer cocktails. But it doesn't mix very well in it's normal state. So here are some ways to make honey syrups for your cocktail bar, and a few recipes afterward. This is the basic recipe for a honey syrup. It has a fairly mild honey flavor, and if you want to boost the honey flavor over the top, simply double the honey in the recipe. You can also use whatever other natural sweetener you'd like instead of honey (agave, turbinado, etc). Combine the ingredients in a saucepan. Bring them to a boil on medium heat, stirring constantly until honey completely dissolves. Remove from heat and allow to cool to room temperature (about 30 min). Store in an airtight container for up to 2 weeks. This recipe combines the amazing flavors of honey and rosewater. For a simple twist, try it with orange blossom water instead. Combine the water and honey in a saucepan. Bring them to a boil on medium heat, stirring constantly until honey completely dissolves. Remove from heat, pour in the rosewater, stir, and allow to cool to room temperature (about 30 min). Store in an airtight container for up to 2 weeks. This recipe starts with a basic herbal tea and combines it with honey for a great, herb infused flavor. Choose whatever herbs you'd like. I like to use single herbs sometimes, or sometimes I make a mixture of herbs to use. Mint is great, so is Lemon Balm. Try Lavender or Hibiscus. Or make it with Chai Tea Spices, or Apple Pie Spice. Quite often I'll also throw in some herbs that no one thinks about like Thyme, or Basil. Anything goes! Combine water and herbs in a saucepan. On medium heat, bring just to a boil. Turn off heat, cover, and let sit for 15 minutes. Add in honey and bring mixture to a boil, continuously stirring, until honey is completely dissolved. Allow to cool to room temperature (about 30 minutes). Strain out herbs and store syrup in an airtight container for up to 2 weeks. This can really be done with any of the previous recipes, but if you just want fruit and honey, here it is! Try with cucumber, berries, apples, citrus, you name it! Combine the ingredients in a saucepan. Bring them to a boil on medium heat, stirring constantly until honey completely dissolves. Remove from heat and allow to cool to room temperature (about 30 min). Strain out the fruit and store in an airtight container for up to 2 weeks. It's a great thyme for Blackberries! (Sorry for the pun) This modern take on a traditional Tom Collins uses a honey syrup made with fresh blackberries and thyme. To make the syrup, use 1 cup blackberries, 1 cup thyme, 1 cup water, 1 cup honey, and follow the above honey fruit syrup recipe (but throw the thyme in with the fruit). It's delicious and refreshing, perfect for a summer party! Combine Vodka, Lemon Juice, and Syrup in a shaker with ice. Shake well. Pour into a pint glass, top off with fresh ice if needed. Pour the club soda over mixture. Garnish with a fresh blackberry and thyme sprig. The traditional Paloma is a great cocktail made with tequila, lime juice, and grapefruit soda. In this version we are making our own grapefruit soda by using a Grapefruit Rose Syrup. For the syrup, simply follow the above Honey Rosewater Syrup recipe, but throw in ½ cup of fresh Grapefruit to the mixture as it boils. If you want it to have more of a rose flavor, double the rosewater at the end. Rim a pint glass (or margarita glass) with salt and fill it with ice. Combine tequila, lime juice, and syrup in a shaker with a little ice. Mix and strain into the pint glass. Top off with club soda, garnish with a thin Grapefruit wedge, and enjoy! One of the more popular drinks this year is a Moscow Mule, which is typically made with Vodka and Ginger Beer. This take on it uses a Lavender Earl Grey Syrup, lending it a slightly British flair. For the syrup, use 1 cup water, 1 cup honey, ½ cup lavender, and ½ cup Loos Leaf Earl Grey Tea. Fill a copper mule mug (or pint glass) with ice. Combine ingredients (save the ginger beer for last, you won't need a whole can) and give it a few stirs. Garnish with a lime wedge and lavender sprig. Enjoy! Jalapenos add a little kick to any cocktail, and this take on an old fashioned has a great kick. For the Hibiscus Ginger Syrup, use 1 cup water, 1 cup honey, ¾ cup Hibiscus, and ¼ cup fresh Ginger slices. In a shaker, combine Bourbon, Hibiscus Ginger Syrup, and Jalapenos. Shake moderately. Strain into a rocks glass with a giant ice cube in it. Add a dash (or 3) of bitters. Garnish with a cherry and a slice of jalapeno. Cucumber and melon go together so well, especially during the summer. So of course I have to include a Cucumber Melon Mojito on this list! For the Cucumber Mint Syrup, use 1 cup water, 1 medium cucumber, 1 cup of fresh mint, and 1 cup honey. Combine Rum, Cucumber Mint Syrup, Pureed Watermelon, and Lime Juice in a shaker with ice. Shake vigorously. Pour mixture (including ice) into a pint glass and add a little more ice if needed. Top with Club Soda and garnish with fresh Mint leaves. Enjoy! In any of these recipes, feel free to change the ingredients around. Play with different fruit, sweeteners, and herbs. All of these can also be made using fresh juices instead of alcohol for the kiddos. Try using pineapple juice instead of Bourbon in the Jalapeno Hibiscus Old Fashioned, use orange juice instead of Tequila in the Paloma Rose, or simply leave out the vodka in the Misty Morning Mule. Have fun, play around, and let me know what you think below!